It’s been a while since we’ve done an exhibition – in fact the last time we did one no-one really trusted e-learning or had a good enough internet connection to support it. Happily for us distance learning is now the norm and we decided it was about time to get back out there and find out what people think of our style of course and what we have to offer. The Food & Drink Expo was the perfect place to start – a hall full of people looking to source new products for their businesses, and a place where people were open to new ideas and happy to stop for a chat. We met some great people at the show and really enjoyed seeing the positive reaction to our animation-based training via the demo stands we had set up. 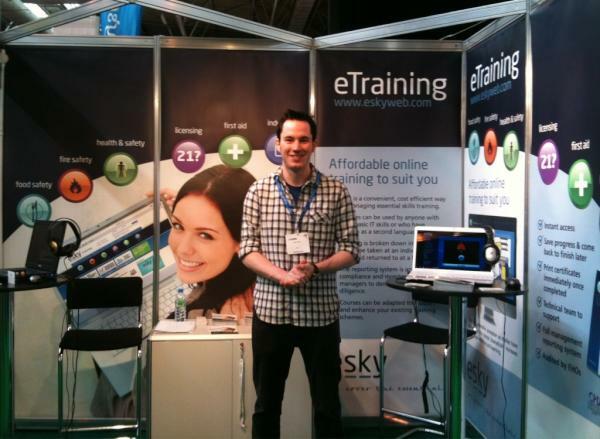 In 2010 Esky Learning Ltd became CPD certified, but what is CPD and why did we get involved? 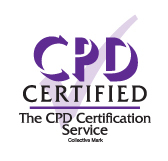 CPD stands for Continuining Personal or Professional Development and ‘describes a commitment to structured skills enhancement and personal or professional competence’ according to the CPD Certification Service. Using CPD certified materials provides a clearer structure to self-study and allows the learner to show achievements, not only helping in learning activities encouraged by the workplace, but highly useful for jobseekers to boost their CVs in a competitive marketplace. Some workplaces or institutes are stricter on proving CPD, for example the ifs School of Finance requires its advisers to demonstrate how they took the knowledge gained by further study and put it to the test, and that ‘reading alone is not CPD‘. This ethos is reflected in other organisations too. This is why Esky was keen to become recognised by the CPD Certification Service, because our courses are tracked in a learning management system and produce a certificate upon successful completion, usually following an assessment, enabling learners to demonstrate their development as part of a CPD programme. describes a commitment to structured skills enhancement and personal or professional competence. E-Learning – What Works and Why? Clearly there is a psychological element to learning in all spheres. Richard Mayer at the University of Santa Barbara has made some interesting and useful findings about how we learn most effectively with e-learning through a series of controlled experiments. Adding graphics to words can improve learning: Mayer found an average gain of 89% in learners that had e-learning lessons with both text and graphics compared to those who simply had text presented to them. Why? Mayer explains that information fed into the long-term memory must be encoded, giving the brain two opportunities to encode information – both verbal and visual coding increases learning dramatically. Explaining graphics with audio improves learning: Mayer found that narrated lessons showed an 80% improvement rate. Again this is because of the way our brains store and process information. Providing a visual and phonetic opportunity to store information stretches the brain to maximise working memory. As well as the design of the lesson itself we must also consider the parameters of technology and environmental factors such as budget, time and organisational culture. E-learning enables you to access reports which provide data on uptake, how long courses take, where people have failed and how many times they have needed to take modules in order to learn and subsequently pass. Through the e-learning process the trainee also has the freedom to fail, many adult learners have a fear of the classroom as they fear visible failure amongst peers. The e-learning environment allows the user to fail, go back over areas of particular difficulty at their own pace and try again. E-learning is also often facilitated by L&D managers, here trainees can learn at their own pace and ask questions if they feel necessary. Managers can also learn about their teams and where extra support in the working day may be required. Feeling Supported by the Employer. People who are given the space to learn in their own way and at their own pace will feel supported and understood by their employers. The sense of development and opportunity to grow is also a valid factor in employee loyalty. And lastly e-learning is good for the environment. The Open University has found that e-learning courses consume an average of 90% less energy and 85% fewer CO2 emissions per student than a classroom based course. According to the HSE, over 200 people are killed each year in accidents at work in the UK and over one million people are injured. Over two million suffer illnesses caused by, or made worse by, their work. In a document entitled ‘Health and Safety; What you need to know‘ the HSE summarise the reasons why everyone needs to be trained. can help you avoid the financial costs of accidents and occupational ill health. Don’t forget that your insurance doesn’t cover all these costs. Damaged products, lost production and demotivated staff can all result. There are some things to consider. First is to decide what training your organisation needs. This involves an assessment of the responsibilities and a review of your risk assessments to determine the areas that need to be covered. Secondly decide on your training priorities, such as inductions for new workers and training required by law. Thirdly choose your training method. Advanced or specialised training may need to be done in a classroom based environment, but general basic safety training can be done quickly and effectively online. Fourth, deliver the training. If done online your staff can log in and begin the course, and managers can track their progress. For specialist training you may need to send staff to a course or bring a trainer in. Lastly, check the training has worked. This can be done via an assessment, observations, checking assessment results to identify areas that may need further time, and keeping training records. The full ‘Health & Safety Training’ document can be found here. Basic online Health & Safety training can be found here. Confusion lies in the fact that some people look for a food hygiene course, some look for a food safety course and many refer to the course as health and hygiene. In essence, if you’re working with food then you need to be starting your training at Food Safety Level 2. The Royal Society for Public Health and the Chartered Institute of Environmental Health publish detailed guidelines for what should be included in courses set at a particular level. The Esky online food safety course is built on the syllabus for Level 2, which is seen to be the basic level for food handlers. Our course was named ‘Level 1′ until around 3 or 4 years ago when the then Royal Institute of Public Health changed their syllabus. Our course was updated with new sections on allergens for example, plus updates to smoking laws and cooking temperatures and became ‘level 2′ in line with the industry guidelines. A level 1 does exist and acts as an induction level aimed at people not directly cooking or handling food such as waiting staff. Esky has developed an induction course for this purpose which you can find out about by contacting us. Yes, there are no entry level requirements for Level 2. If you’re working with food you need Level 2. It’s simple – go to our buying page, select the course you’d like and follow the step by step set up process. It will only take a few minutes and you can start your course straight away or at a later date when you’re ready. If you haven’t got a credit or debit card contact us to order. If you have questions about any of our courses please get in touch and we will be happy to help. * The provision of such information, instruction, training and supervision as is necessary to ensure, so far as is reasonably practicable, the health and safety at work of his employees. This means employers must train staff in health and safety. Training must be relevant to the work taking place, so some form of basic training like health and safety induction or health and safety level 2 forms a good basis to build on. 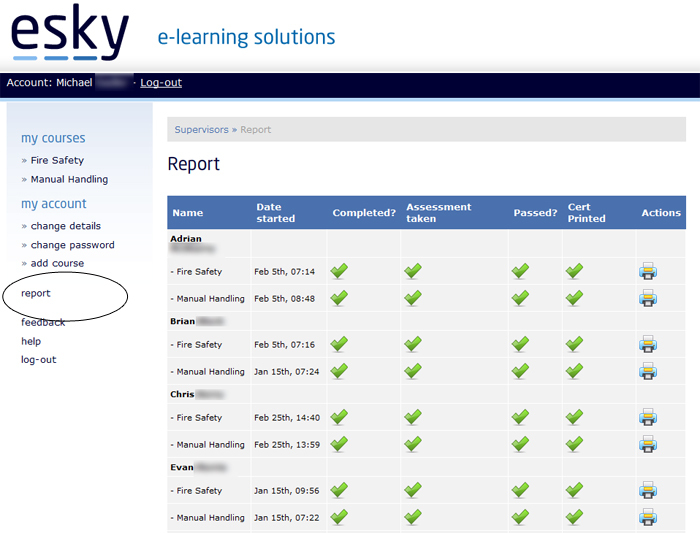 With Esky, not only can staff print off their certificate upon completion, but managers have access to reports which show learner progress, assessment scores and a copy of the certificate. This report can be downloaded into Excel for offline records and remains on www.eskyweb.com too, so you will always be able to prove that you’re complying with the law. For a more in-depth look at how the law applies to our courses click here. In January 2010 we upgraded our website and Learning Management System, and included a feedback form which has provided us with invaluable comments and suggestions about what our customers love about our courses and how we can improve. We’ve been using those suggestions to boost www.eskyweb.com and I’m pleased to announce a new reporting feature for Supervisors/Managers who oversee more than one trainee. Previously, to view trainees, Supervisors accessed the Control Panels for each course, where users for each course were listed separately. The ‘report’ link that now appears in the Supervisor’s Control Panel lists all users alphabetically by first name and shows course progress in all courses they’re assigned to. This quick overview has proved popular in trials, helping supervisors to quickly identify the trainees who haven’t started their course or who have started but not completed. 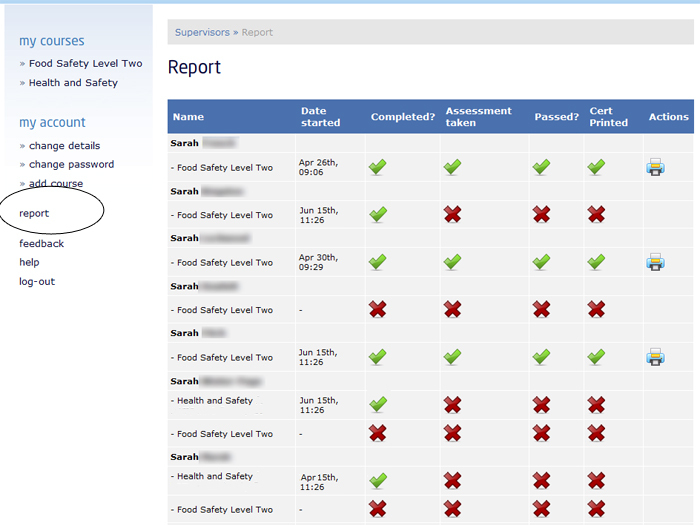 Full and downloadable reports are still available within each course’s Control Panel, but the overview report enables supervisors to manage the training much more effectively. e-learning can give you the freedom and flexibility to learn when and where you want and at your own pace. You can study a wide range of subjects at any level, and e-learning can be ideal if the subject you’re interested in isn’t available nearby. e-learning makes use of information and communications technology to provide innovative ways to learn. Distance learning covers learning remotely on courses such as home study or ‘self-study’ courses, which can be combined with e-learning. If you are a food business you may be aware of ‘Scores on the Doors’; a Government scheme that provides consumers with the results of hygiene inspections carried out by local authorities. According to the Food Standards Agency, the ‘primary purpose of these Scores on the Doors schemes is to empower consumers so that they make more informed choices about the places from which they purchase food’. iPhone users now find it even easier to check local food establishment rating with the new Scores on the Doors app which I talked about in my last blog entry. The three main areas covered by the inspections are confidence in management, structural compliance, and hygiene, cleanliness and safety compliance. By training staff in Food Safety Level 2 you are equipping them with the knowledge to prevent foodborne illnesses and to maintain a clean, safe environment around food. Staff should also have a basic knowledge of general Health & Safety in the Workplace to know how to prevent hazards and accidents. Certificates for all Esky courses can be printed once each trainee has completed the course and passed the assessment. Certificates can then be displayed in your workplace and shown at inspections. Esky courses are audited by independent Environmental Health Officers to ensure compliance with the latest legislation. By keeping records of regular training you will have proof of safety compliance and the knowledge that your staff are working safely around food and reducing risk to your customers and reputation. You will also needs to follow a food safety management system such as Safer Food, Better Business which is a way of keeping records of risk assessments, changes in the workplace and training. 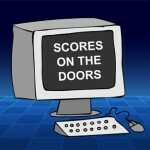 These are some basic ways to improve or maintain a scores on the doors rating.